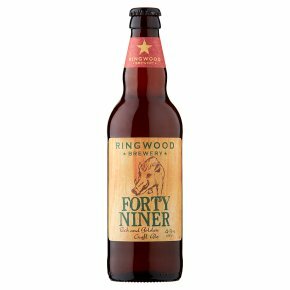 Fortyniner is named after its 4.9% strength and is golden, full-bodied and malty with a deep, bittersweet finish. Made in the New Forest with floor-malted Maris Otter barley, Goldings, Progress, Fuggles and Challenger hops and Ringwood's own famous strain of yeast, it's brilliant with smoked meat or fish. Rich and golden craft ale.We take two things seriously at Ringwood Brewery - our beer and leisure time. Along with creating quality craft ales, we are relaxation enthusiasts. Our motto is to"Visit the Winding Downs"- a place to enjoy some quality time with friends. Our premium golden craft ale, Fortyniner, is bright and full of rich flavours. Great with a charcoaled sausage, mates, and bit of banter.